Thoughts and opinions about the world of archaeology and its impact on the public sphere. Okay, so it's been what, 2 1/2 years since I've posted here? Well, I have some more things to say, so I am in the process of dusting things off, deleting spam, etc. Will have more soon. On the road looking for apartments, so not much time for an update, but I wanted to call people's attention to this site, which lists the "10 Most Amazing Ghost Towns." It's interesting as an example of the many ways in which settlements become abandoned, and the various post-occupational lives they may experience. Many of the processes seen in the pictures are paralleled in excavations of ancient places. Archaeological deposits being created as we speak! Capitoline Wolf a Creation of the Middle Ages? Major changes are in store for me in the near future, which is why updates were absent last week. Moreover, writing posts ahead of time only works if I remember to bring them to work with me. At any rate. blogging will continue as planned with some irregularity likely over the next couple of weeks as I relocate. Fairly big news has been reported by the Italian newspaper La Repubblica and by the BBC (latter in English). The famed “Capitoline Wolf”, pictured above, has been carbon-dated and shown to date to the Middle Ages, and not circa 500 BC as is previously thought. None of the articles give much detail about the precise technique used, and I haven’t seen the paper, so I cannot elaborate. One doesn’t normally associate C14 dating with bronze but I assume that there were carbon impurities in the alloy which allowed the procedure to be performed. 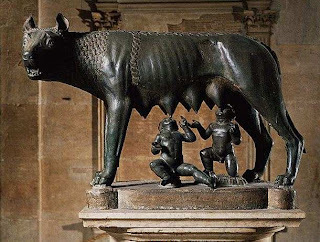 The wolf is considered a symbol of the city of Rome, as according to myth a she-wolf suckled the twins Romulus and Remus after they were exposed by their father. 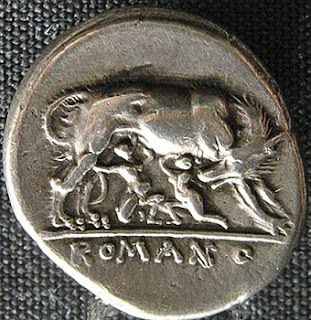 The wolf was an important symbol to the early Romans, as she appears on Republican coins and according to ancient authors there was a famous bronze statue of the wolf and twins in the city. The statue in question has long been thought to be that wolf, although the figures of the children were added in the Renaissance. It appears as an example of Etruscan metalwork and sculpture in all the textbooks. If the finding of the Italian scholars hold up, however, those texts will have to be changed. Doubt was first cast on the statue’s date in 2006, when an Italian scholar published an article arguing that it was produced in a single piece via a wax mold – a technique used on such a large scale only in the Middle Ages. Although the Greeks and Romans knew the lost-wax method, it was mainly used for small figurines, whereas larger statues were cast in pieces then assembled. Here is a link to some more of the reconstructions, although the text is in German. Via Yahoo! News, a report from Egypt that archaeologists there have discovered a complex of 13 tombs at Abydos dating to the Old Kingdom, although the report says "3000 B.C.," which would place them in the 1st Dynasty, a period sometimes called Early Dynastic and distinguished from the Old Kingdom beginning in the 3rd Dynasty -- just sloppiness or an indication that these are particularly old? The tombs are possibly 'royal' according to the story, which just means possibly tombs of queens or high-ranking court officials and not Pharaohs. I'll post more details as they become available. The Smithsonian's website has an interesting article on research by Vinzenz Brinkmann on the use of paint on ancient sculpture. It's been known for a long time that most ancient marble sculpture was painted, although in most cases the paint has disappeared, leaving the familiar white surface. There have been numerous attempts to illustrate what ancient sculpture may have looked like. But while Brinkmann's work is not particularly novel, the article does have some nice reconstructions created by Brinkmann using evidence he has collected, such as traces of paint on the stone. 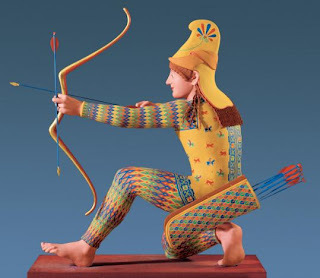 Some of his creations, such as the particolored Amazon archer above, are incorporate substantially more guesswork, but nonetheless are quite plausible. 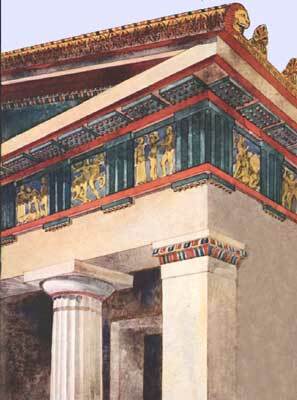 Many of these reconstructions toured last year in the 'Gods in Color' exhibition. This has gotten quite a bit of attention, so I thought it deserved a post. Ferry Farm, a plantation outside of Fredericksburg, VA and the site of George Washington's boyhood home, has been discovered by archaeologists. CNN has a lengthy article here with pictures and video. Excavations have been ongoing for three years -- there wasn't any 'aha!' discovery recently that warranted all the attention, but merely the decision to make an official announcement. Slate's Explainer talks about some of the details of excavation and recording, including just what you do with half a million artifacts.